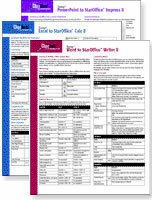 We SELL and SITE LICENSE ClueSheets QuickRef Cards for the Sun Microsystem's StarOffice 8 and for the OpenOffice.org 2.0.x software suites of productivity tools, and for Mozila Thunderbird and Mozilla Firefox Web applications. Commonly performed tasks are clearly identified in ClueSheets and clear, concise, step-by-step instructions are provided to maximize productivity and fully leverage the power of these software applications and Web applications. 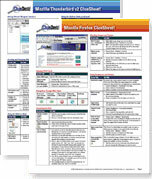 Our single-page (8.5x11"), 2-sided, easy-to-use quick reference cards are sold online and are frequently SITE LICENSED in volume as training and reference tools by a wide variety of organizations adopting or migrating to StarOffice/OpenOffice applications or intorducing and using Mozilla Thunderbird and Mozilla Firefox. 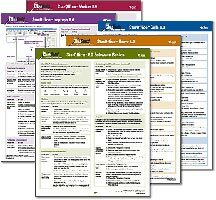 Each full set of ClueSheet QuickRef cards is priced at $15 and you may download them now from this website in PDF format. We SELL and SITE LICENSE our new Mozilla Firefox and Mozilla Thunderbird quick reference cards to help you quickly learn how to discover and use the powerful features of these popular web tools. The Thunderbird ClueSheets will teach and remind you how to create and change email accounts, send and receive messages, control junk mail,label messages, use the address book, and more. Sold in full sets of 3, our ClueSheet Jump! cards are priced at $10/set and you may download them now from this website in PDF format. GENEROUSLY DISCOUNTED SITE LICENSES for electronic distribution (and 'extended' licenses for product bundling purposes) are readily available to all organizations and workgroups. Special site license pricing is offered to educational and non-profit organizations. Please don't hesitate to ask us for a site license price estimate tailored to your organization and budget! "ClueSheets provide me the guidance I need without having to buy and treasure-hunt through massive documentation books or wrestle with frustrating online help systems. Their single sheet size and convenience allows them to "live" right on my desk next to my computer." "It's an outstanding product. I'm impressed and I plan on checking back at the website before buying any more doorstop documentation in the future." Click on a link below to see a list of contents for that StarOffice 8 ClueSheet. Click on a link below to see a list of contents for that OpenOffice.org 2.0.x ClueSheet. Click on a link below to see a list of contents for that Jump! ClueSheet.